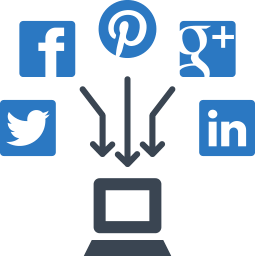 Evolution Social Media Marketing, Develops, Monitors and Grows Your Social Media Presence through Professional Social Media Management. We specialize in developing innovative social media and online marketing campaigns to build brand awareness cultivating and raising the voice of your brand with focused strategies & content driving meaningful social engagement with your target consumer. Captivating storytelling is the heartbeat of all social media campaigns. We will produce engaging content to help shape your brand identity and increase your market share. We will build personal relationships with your audience by being prompt, caring authentic, and understanding. We work with a wide selection of brick and mortar retailers in a multitude of industries as well as working with the dynamic and ever growing online business community worldwide. We are dedicated to ensuring that you love every post on your brand’s channels and that your followers will know that your brand cares and is always available when needed. These are the nitty, gritty details. We are your friendly and affordable social media management team. Effective social media marketing must be strategic and comprehensive and we will work with you to create the social media marketing campaign that will best achieve the business results you wish. Our business philosophy: Be clear, transparent and easy to understand. Our Services are offered on a Month To Month Basis - No set up fees. First months payment is required upfront. We offer numerous premium Social Media Management plans to suit individual marketing needs and budget. Team - You will be working directly with one of us. A dedicated campaign manager that works enthusiastically for you! Groups are a tremendously effective method of connecting directly with your clients and spreading the word about your business, products, sales and services. A viral buzz and awareness can be created through posting regularly in these forums. It is the perfect way to target your client demographic for highly effective focused connection. Wonder why our Three Platform option is the most popular? It's exactly because this is a great option for us helping you engage with your group, your business page AND another platform. Your people are on different social media platforms and you want to connect with them where they are. We can help you determine the right match. Find out what Facebook or LinkedIn group's popularity could mean for your brand – give us call, it could be magical! ** Because social media is social, we have an add-on package where we engage directly with your new group members by greeting them (as you) and making that engagement special while moving them further along the path to purchase from you. Most people are social creatures who seek guidance, awareness and direction amidst the global online community we exist in . Social media paves the way for this dynamic to thrive for the business culture also. Since so many people are tapped into the social world, businesses can thrive using Social Media Marketing to connect, engage, build trust and grow their brand via Social Media Marketing. How do I know which Social Media Platforms are right for my business? The thing is most people don’t know, so you’re not alone if you feel that way to. We’ll work with you to find the best social mix for your brand. We will give you honest feedback on where we think you need to be and help you figure out what’s truly best for you, your budget and your business. What’s the process to start working with you? Just connect with us! You will then receive an invite to a one-on-one call with one of the account managers on our team (Geoff or Karen). We’ll evaluate your business needs, goals and direction. Then, if you feel like Social Media Marketing is something you wish to add to your company’s strategic marketing plan (we don’t hard sell), we can discuss what marketing campaign or plan may best work for you. Access is easy and simple. For your Facebook and Instagram accounts, we will request access to your pages. For Twitter and LinkedIn we need the email and passwords to your accounts. Any other required information we would get from you directly depending on the scope of the campaigns we are working on for you. Can I change my Social Media Marketing Plan later? Yes, you can upgrade your plan or downgrade your plan at anytime to suit your business needs. The main thing is that you maintain a consistent presence connecting, engaging, building trust and growing your brand. Our Social Media Plans are billed on a month by month basis. We don’t lock you into lengthy contracts or set up fees. Your first payment is required up-front for the first month. We accept all major credit cards. A credit card is then kept on file and you will be billed on a monthly basis going forward. We respect that change is constant. If you wish to end the engagement of our services we do require a two week notice prior to disengagement.